Dr. Ali Sepehr responds to several frequently asked questions concerning neck lift surgery and touches upon candidacy requirements. Irvine, CA — Age, weight loss, and even sun damage can make the delicate skin of the neck gradually lose elasticity, explains Orange County facial plastic surgeon Ali Sepehr, MD. He says these effects can often lead to sagging skin or produce excessive wrinkles in this conspicuous location. One surgical method to address these concerns is neck lift, a procedure designed to reduce creases and remove excess skin and fat. However, he cautions that patients considering neck lift surgery should first research the procedure, as well as a qualified facial plastic surgeon, before undergoing surgical treatment. To provide a more detailed resource for individuals seeking to correct skin laxity of the neck, Dr. Sepehr recently published a blog post in which he answered several frequently asked questions about neck lift. In it, he discusses how a neck lift is commonly performed, whether it is typically combined with other cosmetic enhancement procedures, and some of the potential complications. With regards to additional treatments, the Orange County facial plastic surgeon states, “Liposuction is usually routinely performed in conjunction with a neck lift, because excess skin and fat are commonly present together.” Other procedures he may recommend based on patient need include facelift, browlift, and eyelid surgery (blepharoplasty). In addition to these factors, Dr. Sepehr says he also considers the patient’s current health and expectation for results when determining candidacy. Dr. Sepehr says he strives to provide comprehensive procedural information to help patients make informed decisions. Furthermore, he encourages individuals to seek out experienced physicians who will develop customized treatment plans that suit their individual needs while also offering honest feedback. “Make sure you have chosen a facial plastic surgeon that listens to your concerns and is easy to communicate with.” The result, he suggests, is more knowledgeable patients who are generally happier with their results. Fellowship trained at the University of Toronto in Facial Plastic and Reconstructive Surgery, Dr. Sepehr is a board-certified facial plastic surgeon practicing in Orange County. He attended the University of California, Los Angeles for his undergraduate and medical degrees, and then completed residencies in Head and Neck Surgery and Facial Plastic and Reconstructive Surgery at the University of California, Irvine. Dr. Sepehr has attained numerous accolades and has been published in several scientific journals. In addition to being an active member of several esteemed medical organizations, he teaches at the University of California, Irvine Medical Center. Dr. Sepehr is available for interview upon request. 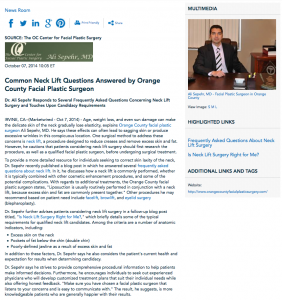 For more information about Dr. Ali Sepehr and his facial plastic surgery practice, please visit orangecountyfacialplasticsurgery.com or facebook.com/ocfacialplastics.